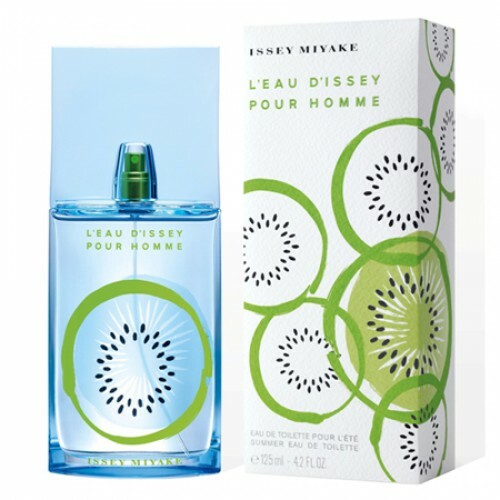 Issey Miyake L'Eau D'Issey Pour Homme Summer 2013 with kiwi fruit. Issey Miyake L'Eau D'Issey Pour Homme Summer 2013 125ml. Eau De Toilette is a vibrant expression of masculinity. Inspired by the brightness of the kiwi fruit, L’Eau de Issey Pour Homme Summer refreshes the notes of the original fragrance with quenching notes. Dynamic and intriguing, it is a fresh take on the traditional summer fragrance. The energetic and fresh L’Eau d’Issey Pour Homme Summer scent bursts into life with a top accord of aromatic coriander and intensely refreshing grapefruit. A playful heart of pineapple is heated with the addictive warmth of nutmeg, while an adventurous woody dry down of vetiver and cypress evokes the freedom of wide, open spaces. Men's version also spirits will delight all fans of the original perfume. It is flavored with spicy coriander in the top notes, where he combined with fresh grapefruit. Fruity-spicy theme is continued in the heart of men's eau de toilette Issey Miyake L'Eau D'Issey Pour Homme Summer 2013, in which the sweet-sour pineapple combined with nutmeg. Base notes consist of vetiver fragrance and cypress.